Google Ads is a powerful marketing platform for all businesses. Whether you are looking to launch a new product, or you just need to drive more qualified traffic to your site, then Google Ads is a great way to reach your goals. Professional Google Ads Management means that your business will benefit from your AdWords campaign without having to risk wasting spend or losing out on great opportunities. 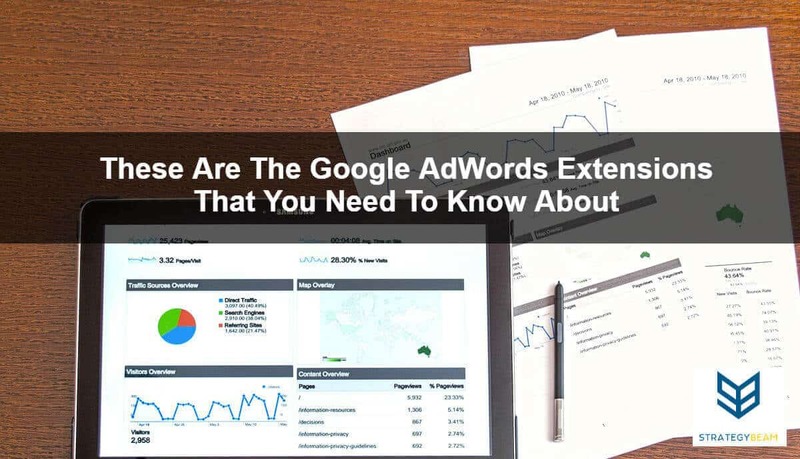 One way that you can enjoy the full benefits of PPC marketing is by using Google Ads extensions in your ads. These extensions provide extra information to your audience. Plus, AdWords extensions also give you the opportunity to push your competitors’ ads lower on the page. This means that you can increase the likelihood of engaging with your audience while also dominating your market. Let’s take a look at some of the most popular Google Ads extensions that you should know about! Callout extensions are one type of ad extension and AdWords that can help your ad stand out from your competition and communicate more value to your audience. When customers see your ads, they could see detailed information to help them engage with your ads and drive conversions. When your ads appear with callout extensions, your audience will see two to six call outs at the bottom of the desktop and mobile devices. Callouts will show differently depending on the device position and other factors. Highlight business offerings. You can promote unique aspects of your business with a few words or a single phrase. Customizations. You can add callouts to your account campaign or ad group level is this provides customization options based on the message and intent of your various ads. Take up more real estate you can use Callout Extensions to grab the attention of your audience and push the ads of your competition down the page. The best Callout Extensions is specific, customized to ad group level and should always highlight the individual aspects of your business. Location Extensions are a type of ad extension that can help people find your business since your address will be displayed right at the bottom of your PPC ad. When an ad shows with a Location Extension enabled, your customers will see a clickable link that appears right on your ad. By clicking on the Location Extension, your customers will be directed to a map with your physical location. This listing will include all relevant information about your business so your customers can come to see your store or office. Location Extensions encourage people to visit your business, so it is best to use this ad extension if you have a brick and mortar address. Adding a Location Extension to your ads can help your business drive more foot traffic to your store or office. Reviews from your Google My Business listings may appear with the ads. When you have Location Extensions enabled your reviews will appear. Your Location Extensions must have at least five reviews and an average of 3.5 starts begin for this information to appear in your ads. If you want to provide your audience with more information about how they can come to visit your store office today! Message Extensions are a type of ad extension in AdWords that allows your customers to click on a button and communicate with your business through a text message right from your text ads. Using this ad extension enables your customers to book an appointment, get a quote, or ask for more information right from a text message. Increase exposure at no additional cost. Adding message extensions is easy and free. Detailed reporting. You can find detailed reporting about the messages between you and your customers. This allows you to track performance and optimize your ads by turning on additional message reporting. Promotion Extensions are a type of ad extension that can show value to your audience within your text ads. You can use Promotion Extensions to highlight sales, limited time offers, and discounts. Promotion Extensions show below your text ad and are optimized to catch the eye of potential customers. The extension can display up to two lines of details about a given promotion. This means that your customers could easily see sales and helps your ad stand out from your competition. Update easily. You could select from some prepopulated occasions and keep your specials updated easily. Don’t lose data with updates. If you update promotion extensions, you will not risk losing data or your more extensive campaign. Flexible scheduling. You will be able to set start and end dates for promotion extensions. This means you don’t risk having specials run past their intended time frame. Sitelink Extensions are one type of ad extension that can add links to specific pages within your website. When someone clicks on a site link extension, they will be directed to a unique page on your website other than the link in your main ad site. Sitelinks offer more opportunities for your customers to click on your ad, and you can take up more real estate by standing out from your competition by using this words extension site. Sitelinks will show differently depending on the device, position of your ad, and several other factors. When they appear on the desktop, viewers will see two to six links, and when they seem on mobile devices, they will see up to eight links. It is important to know that site links only appear in ads that show at the top and bottom of Google search results. You can access sitelinks from your AdWords interface. Sitelinks are free to add, and you will only be charged each time someone clicks on one of the site links. If someone clicks on a site link, you will be charged the same price as though someone clicked on the ad itself. Structured Snippets are another type of extension that allows you to offer more information about your products or services to your audience right from your text ads. Unlike other ad extensions, structured snippets can only present some select categories. These categories include amenities, brands, courses, or degree programs, destination nutrient hotels, insurance coverage models, neighborhood, service catalog, shows, styles, and types. It is important to make the categories and values that you choose the match. Otherwise, Google may disapprove your Structured Snippet if the items are not related. Provide enough information by including at least four types per header. Optimize the mobile devices by creating shorter snippets to appear to mobile customers. Add more than one set of snippets to include at the likelihood that you’re structured snippets appearing and for choose values that provide a complete group of products and services that your business provides based on your category of choice.